I read from Marianne's blog that she had ordered a bag of Jaeger Shetland Aran yarn and of course I had to click the link (like there's nothing else to do at work) - and there it was: an offer I could not resist. 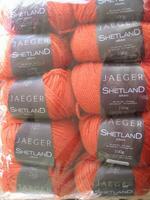 Orange Jaeger Shetland Aran yarn! Free air shipping to anywhere in the world (and the seller was in the UK)! Suddenly I realised that I absolutely need an orange cabled sweater next winter and registered to eBay the next moment and ordered the yarn. You know, the price was in US dollars and the US dollar is still cheap. It's my orange season now. Remember, I bought orange yarn from Tallinn as well. Sunshine! Light! Bright colours! Orange! PS. This yarn is discontinued so if you want any of it, be quick. It's 80% wool, 20% alpaca and the place where I ordered it from is Jannette's Rare Yarns. what a gorgeous color! great buy.